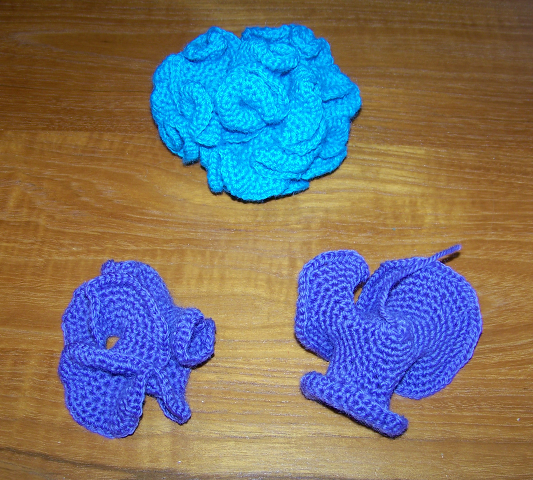 I already wrote about my first experience crocheting hyperbolic surfaces. In my first surface I added two more stitches per current stitch. It took me hours to crochet the last row: the same hours it took me to crochet the rest. For my next project, I reduced the ratio. The light blue thingy has ratio 3/2. I continued making my life simpler. The next project, the purple surface on the left, has ratio 4/3. The last project on the right has a ratio of 5/4 and is my favorite. Mostly because I am lazy and it was the fastest to make. Crocheting hyperbolic surfaces is very nice! While playing with neodymium magnet balls, I did all sorts of spheres by removing some shapes that paves the plane, and then instead of removing I started adding more “fabric” of space and got hyperbolic surfaces. Like for crochet, the easiest way is to make concentric circles of length greater than 6n, for example 7n or 8n… this is the equivalent to adding stiches every rank.